This is a gorgeous crunchy peanut butter ice cream recipe that I found by chance and adore, it is heaven. It is fairly low lactose but you can make it lactose free by using lactose free cream which I will do next time I make it. As you can tell it is the first time I have made this. I love peanut butter, anything with peanut butter and I am in. I didn't realise you can get peanut butter ice cream until I went to Baskin Robbins and tasted it and was hooked. So I went searching for a peanut butter ice cream recipe and found this delicious one. Even though I use cream it doesn't upset my stomach too much it's very mild but next time I make it I will use lactose free cream. Be warned you will be addicted. Combine the crunchy peanut butter and sugar until smooth. Add the milk. Blend on low speed until smooth and the sugar is dissolved. Stir in the heavy cream and vanilla paste ( don't stir too much, just a few turns until it's well blended). 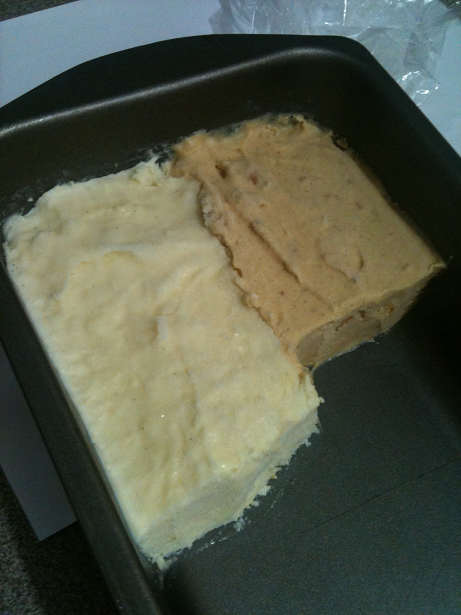 Pour the ice cream mixture into a container, I placed mine in a loaf tin (as metal freezes faster) and into the freezer for 30 minutes. Take out of freezer and beat for a few minutes until smooth. Place back in freezer. Take out of freezer again and beat for another few minutes until smooth. 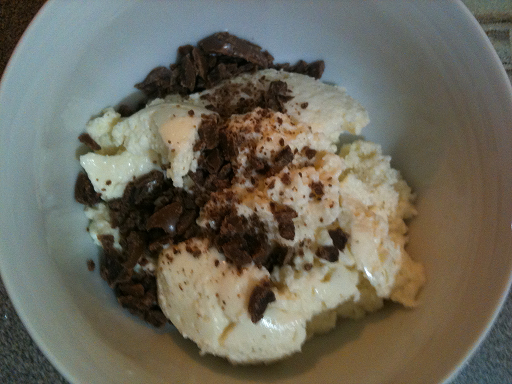 Place any add-ins now into you ice cream as the mixture is set and it won;t fall to the bottom. Place back in freezer and allow to freeze until set. As you can see I have my Lactose Free Vanilla Ice Cream next to it. This lactose free vanilla ice cream recipe is my first attempt at making my own ice cream. Since I don't have an ice cream machine I placed the mixture in a loaf pan tin because it is a metal bowl and they freeze faster than glass or plastic. It's not my favourite recipe as the gelatine gives an unusual consistency but it's a start and the best part is it doesn't upset my stomach. Combine milk, sugar and gelatine mixture in a large saucepan, stir over low heat until sugar dissolves. Allow to cool then stir in cream and vanilla, chill for 2 hours. Using an electric mixer, beat cream mixture for approximately 10 minutes or until the mixture has slightly increased in volume. If you have an ice-cream maker place in the machine using the manufacturers instructions. If you don't have an ice cream machine pour mixture into a shallow tray and freeze for 2 hours then, remove and beat with an electric mixer for 1-2 minutes, return to freezer until firm. When ready grate lactose free chocolate on top and enjoy this lactose free vanilla ice cream recipe.